Source: William S. Pelletreau. 1907. Historic Homes and Institutions and Genealogical and Family History of New York. Lewis Publ. Co., New York (reprinted 1998 by Genealogical Publ. Co., Baltimore, MD; online at GenealogyLibrary.com). Boldface added; also, minor editing and reformatting to improve readability. The first paragraph is useless filler, an example of why these are called "vanity" books. emigrated to America prior to 1700; over thirteen hundred, a regiment in themselves, served in the revolution from Massachusetts alone. According to the "Heralds College," England, the Browns and Brownes have been granted one hundred and fifty-six coats-of-arms. The name has many orthogrphic peculiarities. The first Brown was so called because of his dark, swarthy complexion; Browning was the son of Brown; Brownell was the mighty Brown; Brownlee, the Brown whose house was in a pasture; Brownlow, the Brown who lived on a hill. Various other forms Boown, Bown, Braun, Broun, Browne, Brownn, Brunne, and Brown. The name has been borne in the United States by men of mark in law, politics, business and letters, including the great Abolitionist, John Brown, whose "Soul is marching on." Brown University owes its existence to the Browns of Rhode Island, while in every state the name is an honored one. (I) Edward Browne was of Ipswich, 1654-60; was marshal, 1656-69. He married Faith _____, and died February 9, 1659-60, in Ipswich. His wife survived him and married (second) Daniel Warner. Children of Edward Browne: Joseph, John, Thomas, Bartholomew, and two daughters. (II) Joseph Brown, son of Edward Browne, was born about 1639. He was a farmer and turner and lived in Ipswich where he died September 30, 1694. He married February 27, 1671, Hannah Asselbie, who survived him. Children, born at Ipswich: Joseph; John; Hannah; Thomas, of further mention; Elizabeth; Samuel; Benjamin; and Sarah. (III) Sergeant Thomas Brown, son of Joseph Brown, was born in Ipswich, December 26, 1678; died at the Hamlet, June 27, 1767. He married Abigail Jacobs, intentions dated 1704. She died 1735. Children, born in Ipswich: Mary; Thomas, of further mention; Ephraim, died young; Jacob; Edward; Ephraim (2); Nathaniel; Daniel; and Abigail. Bishop and had three sons and three daughters. (V) Colonel Daniel Brown, son of Thomas (2) Brown, was born in Windham [Windham Co.], Connecticut, January 13, 1747; died at his mansion near Hebron [Tolland Co.], Connecticut, June 18, 1832. During his early manhood, he was a merchant, but, in consequence of the revolutionary war, gave up business and filled the position of deputy commissioner under General Jonathan Trumbull, which station he held to the close of the revolution when he retired to a farm near Hebron where he resided until his death. On leaving the service, Colonel Brown received his dues from the government in "public securities," which later greatly appreciated in value, providing a generous fund for the education of his children and a competence for his old age. 1. 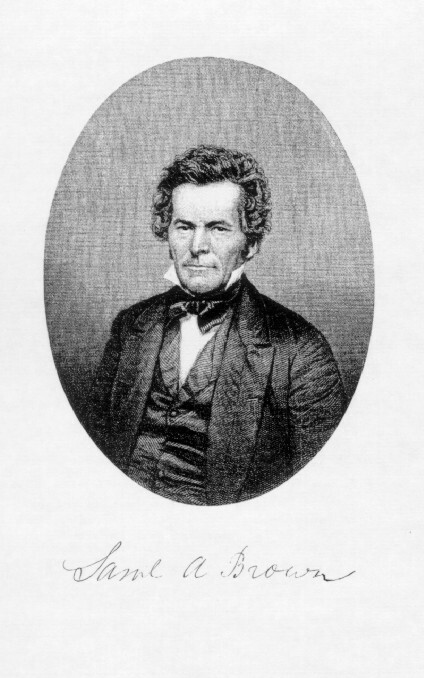 Daniel Bishop, graduate of Yale College, 1800; studied law; settled in Batavia, New York, and became one of the ablest lawyers of Western New York. He died at Batavia, July 7, 1842. 2. Henry, graduate of Yale, 1808; studied law; settled first at Springfield, New York; removed to Herkimer county, where he became the first judge of the county. Later he removed to Batavia, New York, thence to Chicago, Illinois, where he died in 1859, aged sixty years, leaving a family. Judge Brown wrote a book, Anti-Masonry, and a history of the state of Illinois, both of which were published. 3. Thomas, was a farmer. After the other sons left, he returned to the old homestead and cared for his aged parents. He became quite wealthy and died August 13, 1851, aged sixty-eight years, leaving the farm to his son, Thomas L. Brown. 4. Samuel A., of further mention. 5. Ephraim, studied medicine, received his degree M.D., and settled at Batavia, New York, where he died May 13, 1836, aged thirty-nine years. (VI) Samuel A., son of Colonel Daniel Brown, was born at Hebron, [Tolland Co.,] Connecticut, 1795; died at Jamestown, [Chautauqua Co.,] New York, Sunday, June 7, 1863. He was well educated and studied Latin and surveying, under very capable instructors. He was intended for a farmer, but his preference was for the law. His parents yielded a reluctant consent, and, in August, 1813, he left home and journeyed to Springfield, [Otsego Co.,] New York, where his brother Henry was practicing law. He was then eighteen years of age, and, from then until he was twenty-one, he studied to prepare for his profession, excepting three months he taught a district school in Springfield, and a few weeks, in 1814, when he marched with the Otsego militia to Sacket Harbor, where the company was soon discharged. While in Springfield, he practiced considerably in the justice's coursts. In October, 1816, he left Springfield, on horseback, with an entire capital of eighty dollars. He visited his brother, Daniel B., in Batavia [Genesee Co., NY], then went as far west as Painesville, [Lake Co.,] Ohio, then returned to New York state, and, in November, 1816, located in Jamestown, Chautauqua county, then recently named, containing only a few unfininshed houses, no postoffice or mail facilities, amid a forest of tall timber, but with a fine water power and without a lawyer. He had not been admitted to practice in any court of record, but the Chautauqua county court of common pleas being in session at Mayville, he applied for admission, on examination passed, was admitted to the Chautauqua county bar, and was the first lawyer to settle in Jamestown, then just becoming known by that name, heretofore having been called "the Rapids or Prendergast Mills." The nearest lawyer was at Mayville, twenty-two miles away. His first office was in the lower northeast room of the unfinished two-story house, on the southeast cornder of Main and Third streets. His geneal and unassuming manners gave him a ready introduction to the people, and "Squire Brown" soon became the oracle of law in the village, and at once gained considerable business in justice's courts, and was usually employed by one of the parties in suit in the vicinity in the court of common pleas. He frequently traveled to neighboring towns, on horseback, carrying a few law books in his saddle bags, to attend suits in justice's courts, and was reputed fairly successful, but, having been admitted to practice in the supreme court, he made the necessary arrangements withJacob Houghton, then of Mayville, by which he certified his continued clerkship, and, on October 31, 1818, he was admitted as an attorney of the supreme court. His counselor's license, in that court, bears date, April 17, 1827.
and patron, Judge Prendergast, five improved village lots on the west side of Main street where he built his first law office and later his dwelling house, both of which he owned at the time of his death. He was appointed a justice of the peace in 1818 and held the office about four years. He was the principal magistrate of the village and did a large and profitable business gaining the reputation of an honest and impartial justice. In 1824, he was licensed as a counselor in the court of equity by Judge Rochester. On March 18, 1825, he was appointed master in chancery, an office he held, by reappointments, about twenty years. In the same month and year, he was appointed brigade judge advocate under General Horace Allen, which office he resigned in 1828. In 1827, he was admitted a counselor in the court of chancery. In 1828, he was appointed district attorney by the judges of the county court, holding that office for ten years. The same year, he was appointed agent of the Cherry Valley Land Company, by which he had the sale of about forty thousand acres of land in Chautauqua county. In 1858, he was elected special surrogate of Chautauqua county. During his law practice, he had as partner Richard P. Marvin, later a judge of the supreme court; George W. Tew and, in succession, his sons, Charles C., Theodore, and Levant B., were his law partners. He probably drew more pension papers, for revolutionary and other pensioners, than any other attorney in the county and lived to see all of that class of his old friends pass away. He first entered public political life in 1824 when he was nominated by the Clinton party for the state assembly; and, although his party was in the minority, he came within two votes of being elected. in 1826, he was again nominated and elected, by a majority of seventy votes. In 1828, he was elected one of the trustees of the village of Jamestown and, by them, elected President. In 1838, he was elected superintendent of the poor of the county, serving five years. In 1843, he was nominated by the Whigs for the assembly and defeated, although running, as he always did, far ahead of his ticket. In 1844, he was again nominated and elected by a large majority. He was chairman of the committee of "Aliens" and performed some very important work for the state. On the organization of the Chautauqua County Bank, in 1831, he was elected a director and continued as such until his death, being also attorney for the bank. He took an active part in the incorporation of the Jamestown Academy and the erection of suitable buildings for the same. He served as one of the trustees for the academy from its organization until his death and, during the latter years, was president of the board. He was converted in March, 1834, and April 6 of that year, with his son, Charles C., united with the Presbyterian church. He was one of the incorporators of the First Presbyterian Society of Jamestown, frequently served as trustee, and was always a liberal contributor to its support. February 9, 1849, he was elected an elder, holding that office until his death. He frequently attended the meetings of the Buffalo Presbytery and, on one or more occasions, represented that body in the general assembly of the Presbyterian church. He also represented Buffalo Presbytery one or more years as commissioner of Auburn Theological Seminary. He was always interested in the preservation of the early history of the settlers and settlements of the county and, in 1843, wrote a brief history of Chautauqua county, which appeared in the Jamestown Journal, later in book form. In 1847, he delivered a course of lectures on the history of the town of Ellicott before the students of Jamestown Academy and others. In 1840, he became a life member of the Chautauqua County Bible Society and was a life member of all the county benevolent societies. He frequently delivered public lectures in favor of total abstinence and became one of the most efficient temperance advocates of the county. He was a member of the First Independent Rifle Company, organized in James town in 1818, and was appointed Captain April 24 of that year. He was made a Mason in Mt. Moriah Lodge in Jamestown in 1817, was elected treasurer in 1820, and held that office for many years. He transacted a large legal business, and no attorney at the bar prepared his causes for trial with more care. His library was the best of any attorney in the vicinity, and he was always fortified behind an authority. In politics, in early days, he usually voted with the Federalists, afterward with the Clintonian and Whig parites. He joined in the election of President Lincoln and gave him his hearty support. Springfield, New York. She died August 31, 1862, having over-exerted herself in trying to save their household furniture at the time of the great fire in Jamestown, January 31, 1861. She came to Jamestown soon after their marriage and commenced housekeeping in the rear room of his law office, which was then kitchen, parlor, pantry, and bedroom, with an outdoor fire by the side of a large pine stump in the rear of the office having a temporary board roof over it where she did the cooking for her family and several of the mechanics who were engaged in erecting their dwelling house. This stump was long preserved by Mr. and Mrs. Brown as a memento of the past, and he was fond of showing it to his friends as Mrs. Brown's first kitchen. She was a devoted Christian and was one of the most efficient members of the Congegational church and, afterward, of the Presbyterian. Her house was a hospitable and welcome one to visiting ministers in the early days; and, for practical good sense, sound judgment, and firmness of purpose, perhaps she had no superior in the church of which she was a member. Mr. and Mrs. Brown were the parents of eleven children, five of whom died in childhood. 1. Charles C., married Eliza Jane Hoskins; he died in 1847, aged twenty-six years; children: Charles O. and Evelyn, deceased. 2. Levant B., a lawyer of Jamestown until his death in 1875; he married Florinda M. Barrett; no living issue. 3. Theodore, a lawyer of Jamestown; married Minie Knowlton; no living issue. 4. Henry E., of further mention. 5. Margaret P., married Salathiel Batcheller; children: Eva B. and Levant B.; this family settled at Victor, Iowa. 6. John T., married Samantha C. Neff; children: Samuel A., Louise, George W., these are living; Bessie, deceased. (VII) Henry E., son of Samuel A. Brown, was born in Jamestown, New York, October 4, 1826; died there January 13, 1897. He was educated in the city schools and was the junior member of Crosby & Brown, who established a steam tannery in Jamestown in 1851. Later, he operated a general store at Clear Creek, Chautauqua county, which he sold, and, in 1855, moved to Iowa City, Iowa. There he was assistant county clerk and, in 1860, was elected county clerk. At the outbreak of the civil war, he entered the quartermaster's department of the Army of the Cumberland, serving until near the close of the war when he returned to Jamestown, which was his home until his death. He was an active member of the Republican party and, in religious faith, he and his family attended the Episcopal church; he was very liberal in his views. He married in Jamestown, January 21, 1852, Helen Sprague, born at Fly Creek, Otsego county, New York, June 10, 1828, daughter of James [B?] Sprague, who married Mary Maria Badger at Fly Creek, New York, September 5, 1827. After his marriage, Mr. Sprague lived in Rochester and Westfield, New York, coming to Jamestown about 1844 where he became a member of the firm of Sprague & Steel, owning and operating a foundry and machine shop for many years, one of the first in the city. He was a devoted member of the Universalist church when there were few members of that faith in the village. He was a strong Republican from the organization of that party and a lifelong follower of Horace Greeley, having taken and read the New York Tribune from almost its first issue. He died Septemer 22, 1867. Mary Maria, his wife, died January 1, 1888. Helen (Sprague) Brown was a descendant of the Sprague and Angell families of Rhode Island, both well known and prominent. Children of Henry E. Brown: Agnes, born at Clear Creek, Chautauqua county, New York, November 26, 1852, died in infancy; Charles Henry, of further mention. and Accepted Masons, and of the Independent Congregational Church. Mr. Brown is unmarried.